So far, so good. The recipes are delicious and ensure that you are full at the end. I wish there were more options for individuals who don’t like eggs. : ( You do have to be organized about what you are planning on eating. Definitely not for someone who wants to eat as normal but track - you have to stick to the food plan. I like the shopping list feature. Could be made better if the app showed you what you picked - I had to write my daily picks down in order to see which meals I prepped were for which days. I recently started the Freeletics body weight program and am so far enjoying it. In the subscription I got, it included the nutrition coach. I am a vegan, and though I can omit recipes that contain meat, the recipes I am given do not cater to people who avoid animal byproducts. Please add vegan recipients, I truly believe this can be a great app! app is free to download, but you must pay per week for their service. They tell you this after you had already set up account, confirmed email and logged in for this first time. I am a Louisiana Cajun girl at heart that loves to be able to taste the different seasonings in food so I was very hesitant in purchasing the nutrition coach with the Freeletics Bodyweight portion that I’m doing. But I was like hey I can at least try for 3 months because I was in need of a drastic lifestyle change. I was then very hesitant in actually doing it because some of the recipes for my day 1 looked disgusting honestly but I went with it. I am currently on week 3 and I absolutely love it. I’ve only come across 1 recipe that I just didn’t like out of the 20 recipes I have tried. They give you 3 different recipes for each of the 4 parts of the day so you have 12 different recipes you can eat for that day. I love the versatility of the recipes and you can tell that they are specifically tailored towards your goals because they are categorized based on different things. They recipes are also pretty easy to make and really delicious. As far as shopping goes you get to choose which recipes you are going to make for the week by adding that recipe to your shopping list and then it compiles a whole list together. I do like that but it can use a few tweaks such as compiling the list in order of dairy, produce, etc.but it has been pretty easy to shop because it gives you how much you need of each as well. I am looking forward to the lactose intolerant version because a lot of the recipes require a lot of dairy (cottage cheese, quark, yogurt, milk) but so far I have been able to handle it by just substituting the milk with almond milk and only choosing the recipes with dairy least often because I am partially intolerant. But overall I love it. That’s all the “coach” is.... unlocking the recipes that are locked. The only personalized thing is the meat protein you don’t eat, your weight, height, age and region. I still haven’t seen the 7 day plan, just one new suggestion every day of 3 recipes for each meal. No ingredients substitutes unless in the milk and yogurt area. It does not take in consideration any personal tastes. “Tailored for you” is a huge stretch. There’s no real coach behind it. Probably just an algorithm. And you get a few messages every day. You can’t even pick and chose the meals from the suggestions and to your “day”, for exemple. You can only click on ‘I cooked this” and you get a star. How cute! Or put in your shopping list. I am not saying it doesn’t work. They are just not ver forthcoming about what it really is. Customer service offered me a refund, but I have to contact iTunes for that, which is proving very unsuccessful so far. They should refund it themselves! Most of the recipes sound great but I have food restrictions that aren’t available to add in the restrictions portion. I don’t eat beans and I’m gluten free, it seems like most of these have one or the other. This is a recipe book. I don’t want any of their recipes. I was under the impression this was a nutrition guide and tracker. It wouldn’t be bad to INCLUDE recipes, but if you want follow this get ready to shopping, start cooking, for every single meal. I am a vegetarian allergic to soy. I have a diet that isn’t unhealthy but could use a little clean up. I wish I knew this how the nutrition app worked before I bought the plan. It is just a collection of recipes iterated ~ doesn’t help those who already have a custom diet. The recipes are tasty though. my coach DOESNT EVEN WORK. all i get is a “connection doesn’t work” and i’m at home with wifi. i literally payed for something that doesn’t work. Workout app is great, the nutrition is useless. No option to add your own recipes, say toast with peanut butter, so you’re forced to either only eat their complicated food or have inaccurate results (: would not recommend. The shopping list needs to be divided into grocery store sections (produce, dairy, etc) The meals are okay but the option to meal plan for the week (ie making a meal 3x a week or something would be good. This app is great for getting me in the mindset of clean eating. I love the updates is recently made to its "Recipes" tab. Is there anyway a feature could be added to search by a certain ingredient? That way, I can make recipes based on what I already have instead of spending money when I don't need to! This app is useless the recipes are disgusting! The quality of this app is constantly degrading and features dont seem to improve. Every time they make a release, a ton of features get broken. if you still care to improve the app: 1. 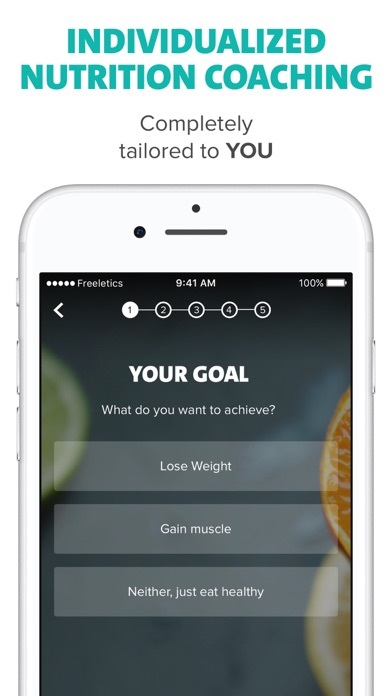 Integration with other freeletics apps and iPhone's health app. That should automate tracking of activity and body measurement reading. 2. ability to add shopping items individually 3. 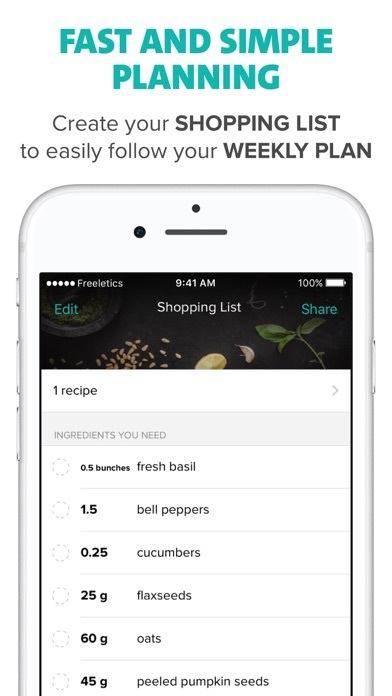 Offline access to meal plans, like for the coming week 4. Ability to sort shopping list by alphabet, item type or other metrices 5. Ability for users to mark meals for cooking from recommendations. I frequently find myself unsure of what i previously decided to cook for a certain day. 6. Subscription is pricey. Consider adjusting price. You have to buy a coach for $30+ to actually do anything. I love the recipes in this and I follow the guidelines I just wish that the recipes were more on the go friendly. My job has me on call and I don't have time to cook all four meals a day, sometimes I don't get home to cook at all. I cook the recipes as I can but most of the time I end up packing fruits and vegetables and eating those throughout the day. I would love suggestions on what would be best to eat as is if you can't cook because you're not home. DO NOT GET UNLESS YOU WANT TO WASTE MONEY The app itself is difficult to use. They charge a steep price for having poor organization I also cancelled my subscription the day it auto renewed and they have refused to refund me. I'm not some wealthy person who can afford to have money disappear for no good reason. Their customer service team does not care as long as they have your money. Do not buy. This community of athletes is actually just a good marketing team. It's a good addition to the rest of the Freeletics apps but I think most people like myself won't find themselves using the coach functionality. 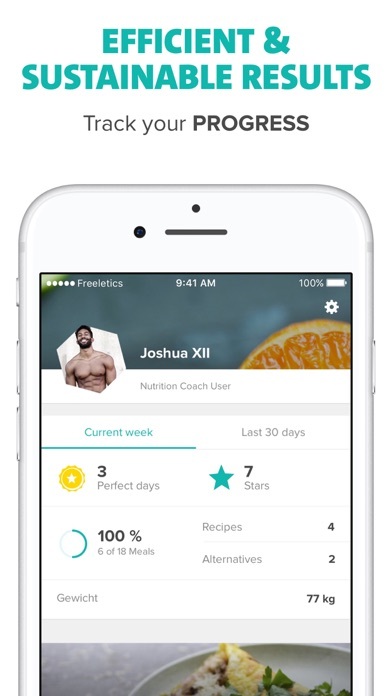 I would prefer to see a free version with just the recipes for those who subsrcribe to the coach plan on one of the other apps. As it is right now I can't justify paying a monthly subscription for a recipe book, regardless of how helpful. Great options for a healthy way to eat meals!! Exciting meals!! I love it. Makes dieting so much easier. 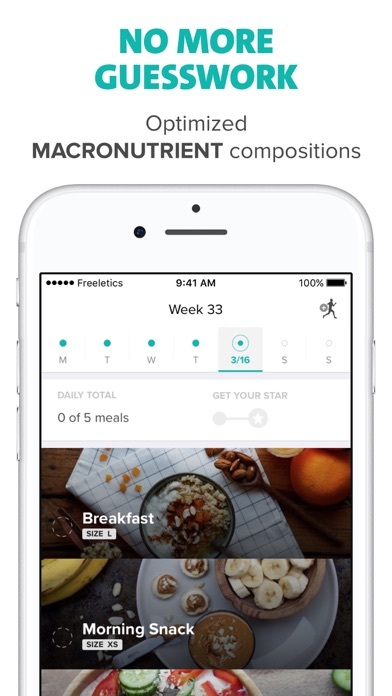 I've been doing the Freeletics nutrition and workout plan for only a week now, but I can already tell that this app is going to be something that I'll be using for a very long time. 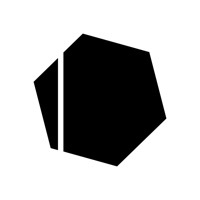 If you're wanting to get in shape or stay in shape, this app will make it so much easier for you to reach your goal. This app does have some good ideas for recipes. However, I have a personal aversion to peppers and tofu, and I've been given four or five recipes for two days that have those in them. The only food preferences you can put are basically whether or not you're vegetarian, vegan, etc. Plus, it automatically decides what 'size' meal suits you best. I can tell you right now there's no way I'd be able to eat half of what it's giving me for each recipe. This has program has been a great help since I learned how to cook healthy meals. I started a week ago, I lost 5 pounds. I couldn't believed it. The menus are simple and easy! I enjoyed it. New Years resolution this year was to improve my nutrition. Couldn't have stuck to it without this app. Many of the recipes are quick, easy, and satisfying. Best of all, the coach eliminates the agonizing question of 'what's for dinner'. Highly recommend giving this a try if you're on the fence. My problem with this is that you have to pay to get a coach. Other than that, I am fine with the app. Lots of great options for meals, have my choice of great recipes. This is some of the best food I've ever eaten, and I feel full all day! I just started this week so I feel like I'm cooking a lot and always running to the grocery to grab missing ingredients, but I plan to get organized with everything this weekend so hopefully week 2 won't seem so hectic. But, like I said, the food is great plus I've already lost 6 lbs in 3 days so it is soooo worth it!!! It's only been a few days, but I love Freeletics! Great app, that is a legit substitute for expensive trainers and nutritionists. I do wish I could export my grocery list to Wegmans, Amazon Fresh, or some such grocer app, but not a big deal. Highly recommend. The ability to meal prep and plan with this app is stellar. This app has been life changing. I bought the coach and it's really like a personal trainer. The new updates are great. I love the new recipes and how the workouts show what muscles are being targeted. The recipes in their database are both tasty and filling. It would be five stars if there was a way to coordinate the ingredients between one day and the next, or have a way to use one day's dinner leftovers as the next day's lunch. Literally just gives me a screen that says: "you weren't a coach user that day"
I wasn't sure how this worked at first. But when I started using it, I am glad I purchased it. I have lost weight with the help of his app. It plans my meals all day long for me. You are assigned a coach. All the meals are healthy choices. It also adds the meals to a shopping list. Not all the meals I am familiar with. But I have learned to be open minded about different foods and flavors. I would 100% recommend this app. 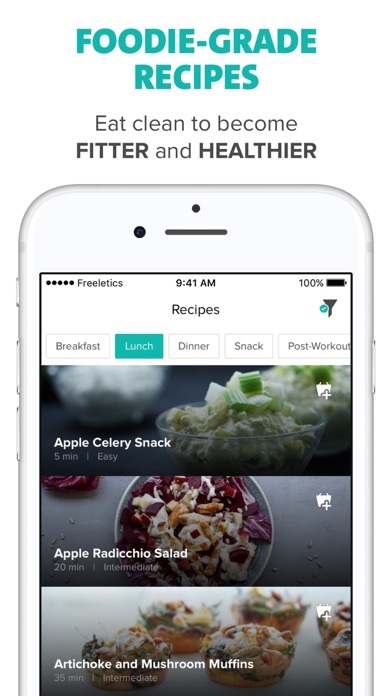 I lost eight by changing my eating habits with the help of this app and also by adding exercise to my daily regiment. I downloaded this app because it advertises as clean eating and that it allows restrictions. The only restrictions it allows have to do with meat - nothing allergen or medical related. In each recipe, there is a listing if it is gluten free or lactose free, but these are not searchable options. Additionally, the recipes tagged as being lactose free have cheese in them. I'm pretty sure cheese doesn't belong in a clean eating plan. Such a disappointment as far as nutrition and diet apps go. I'm going to keep using it because the recipes are awesome! The only problem I have is that I cannot open up my saved (logged) recipes once I actually have all of the ingredients and am ready to begin cooking!!! Please fix this and I'll change my rating, I think you guys are awesome and I don't mind paying it's just this needs to work better! Im quite unhappy with the 'coach' subscription. Frankly i find it unrealistic to cook so many different meals ad it suggests. Your grocery list will get very large and expensive. The recipes are great and on their own they provide great help in clean eating. I'm only using the free version, mainly for the recipes, healthy eating, macro count. Best app I've used yet. This is soooooo freaking helpful and easy to use compared to other apps. I wish I had read the reviews prior to engaging with this application. I work in the the strength and nutrition fields. I decided to give freeletics a chance on behalf of my clients. Firstly, the product is poorly named—to get any sort of value out of the product you've got to sign up for a ~40$ monthly membership. My biggest grievance, however, is not its insane cost—it's the insanity of this program. Any fitness app that provides the option for a "coach" (at extra charge) should, by implicit definition, designed to be accessible to individuals for whom the subject is new. If such is the case, the company ailed—here are today's meals suggestions, for example (each meal falls under an absurdly named "macro"-category, such as "Opes," "Impleo," "Eques," "Voro,"etc. ): Breakfast: "Vita": Sweet Potato Corn Muffins | Vanilla Chia Pudding | Simple Banana Muffins Morning Snack "Nitor: Chicory Salad | Salmon Sandwhiches | Coconut Quinoa Muesli Lunch "Vita": Beetroot Curry | Grated Carrot and Halloumi Salad Dinner "Nitor" : Baked Pumplin with Quark Sauce | Quinoa and Grilled Chicken Salad | Chicory Salad Name alone suggests the high price of each meal—this is clearly targeted toward a specific demographic. Fortunately, do recipes accompany each meal—however, users did not sign up for a cooking application. Furthermore, the complex process of buying/cooking obscure meals with absurd names represents a huge discouragement to any dieter. Each day that a person opts for a "Vanilla Chia Pudding" breakfast (rather than just eating raw oatmeal and a protein shake—which have better nutritional macros) brings him or her 24 hours closer to abandoning the diet altogether. Lastly, the UI isn't intuitive, the program is hard to tailor—and harder to cancel—and provides surprisingly few options for an app with such a large and developed menu. I imagine the app makes for fairly lucrative revenue when hundreds of confused, invested customers decide to upgrade to a "coach." In a cost benefit analysis, the variables don't add up (high-end food + 40$ / month or more + time investments)—if you've got this much money, hire your own nutritionist. I'm still struggling to figure out how to use the app. Not at all intuitive and trying to put together a shopping list has been a nightmare. Complete waste and offers no customization, personalization, or interaction. Regret ever giving them my credit card information. I have had nothing but trouble with this app. I ignored the previous reviews and downloaded anyway, thinking they had worked the bugs out. I purchased a 3 month subscription that will not show on the application. When I try to go in to restore the purchase or alter my user data, the app crashes. Speaking of crashing, it does that all the time. Don't waste your time or money on this. There has to be a better app out there!